Kanye West is still not done releasing new material. Today's installment is a new music video for his two songs, "All Day" and "I Feel Like That." The video, which first premiered privately last year at LACMA, is frantic and high-paced. It follows West rapping in an empty warehouse—all in one take. He's sweating and breathing heavily; sometimes on screen, sometimes not, wavering in and out of focus. It was McQueen's idea to go for West to take an exhausted look; he even asked the rapper to "beat himself up" before they started filming, the L.A. Times reported. According to the paper, McQueen wanted to create a "microscopic portrait of West" that focused on "gaze and the gaze following you." 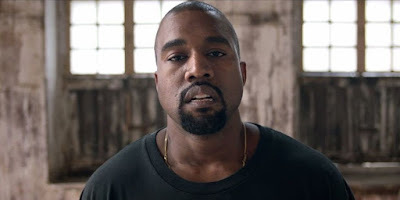 Though other artists are featured in "All Day," Kanye is alone on camera. It's a minimalist work, much like his outfit: an all-black ensemble with tan Yeezy 750 Boosts. The video, directed by Steve McQueen and shot in London, was "uploaded illegally," production house Unit Media said Monday. Pitchfork reported that the video has since been removed, but here it is in its entirety.